Upon workshop artists’ request, I did the third demo. The main object of this demo was a white sugar bowl with gilded gold lines. It was so fun painting it. I felt more at ease dealing with white objects now. I painted the light area of the sugar bowl quite gray, so I have enough value range for high lights. I think I can push the value down even more and still make the sugar bowl look white. It is amazing how much potentials we have in our painting practices. That is the way we grow. This is my second demo at my Sacramento workshop. I usually be conservative when I do demos. I don't want paint something I have not painted before. But this time is exceptional. I got several branches of camellia outside the art center. I have not painted camellia before, but they are so beautiful and I could not resist the temptation to paint them, even doing this in front of many artists. The result turned to be much better than I thought. I enjoyed it very much. After this demo I have learned that camellia is the city flower of Sacramento. Continuing my travel to the next station, I have arrived at Sacramento and started my workshop teaching at the Capital Art Center at S12. I want to thank Patris Miller for organizing my workshop again. I have met many new friends and feels so good to see many old friends. Thank you all for coming. This is my first demo. I put a lot of gray colors on this one. It was a lot of fun. This is the second 16" x 20" I did in Northern California. My friend Fongwei has many beautiful bronze props. I enjoyed so much painting them. The subtle greenish color really enhances the dark purple of grapes. Plus the warm orange color of the tangerines, I feel I have heard the chatting among those fruit friends. Similarly I enjoy chatting with you all on the Internet. I am the small grape on the table top. 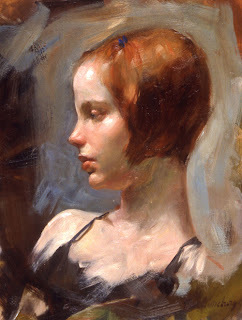 Max Ginsburg will teach and demonstrate his unique approach to portrait and figure painting in an intensive 5 day workshop at the Gemini School of Visual Arts just north of Austin, TX. Max has had a long career as a commercial illustrator with over 200 book covers under his belt. He has also won many awards for his fine art paintings including Best of Show in this year's Art Renewal Center Salon. In 2011 Max released a retrospective book spanning 50 years of his work coinciding with retrospective shows opening in New York City and Indiana. Max taught for many years at the School for Visual Arts in New York City and continues to give workshops at the Art Students League. This is an opportunity not to be missed for artists in the Southwest as Max rarely teaches outside of New York City! Painting still life when moving constantly. It sounds really oxymoron. Well that is my life now, and it will be like this for a while probably. I am learning to adapt this new life. Currently, I am staying with my friend Fongwei Liu in northern California. This is a painting I did in Liu’s studio. I spent two days on this 16” x 20” and plan to send this painting to a gallery. It feels so good painting together with a good artist. Painting large is very different from painting small paintings. I feel happy I am able to do some gallery level paintings when I am traveling. So I gave a oxymoron title for my today’s painting as well. I was so happy meeting so many young artists at the Putney Painters Show. The artists in this photo are all in their 20th, well except one. 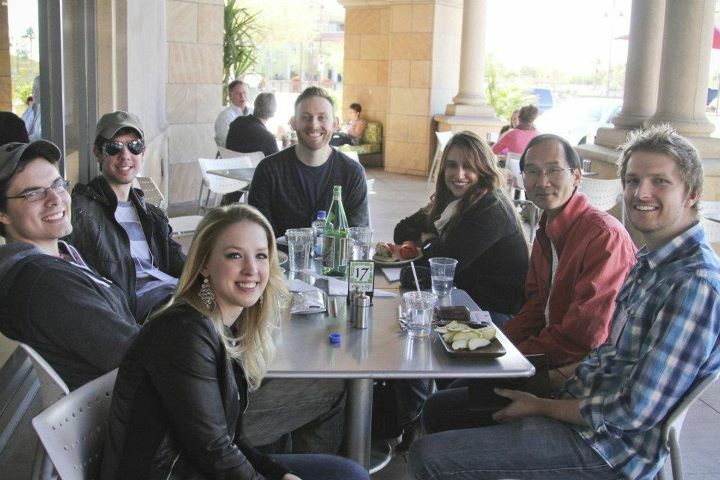 From left to right are Tyler Murphy, Daniel Keys, Anna Rose Bain, Ryan Mellody, Michelle Dunaway, me, and Taaron Parsons. It is a great sign for representational art. Thank you Anna for the photo. I am sitting at Phoenix airport waiting for my flight to San Francisco. The three day excitement at Scottsdale has not subsided yet. I had an extremely informative several days with this incredible group of artists called the Putney painters, especially Nancy Guzik. I am humbled in front of their remarkable paintings, and learning like sponge. They are wonderful teachers. I watch a few wonderful demos. they are very helpful for the improvement of my art. Besides this marvelous show. I really enjoyed spending some wonderful moments with a few local artist friends. Specially I want thank Li Hua and Mark Mahalik for their hospitality. 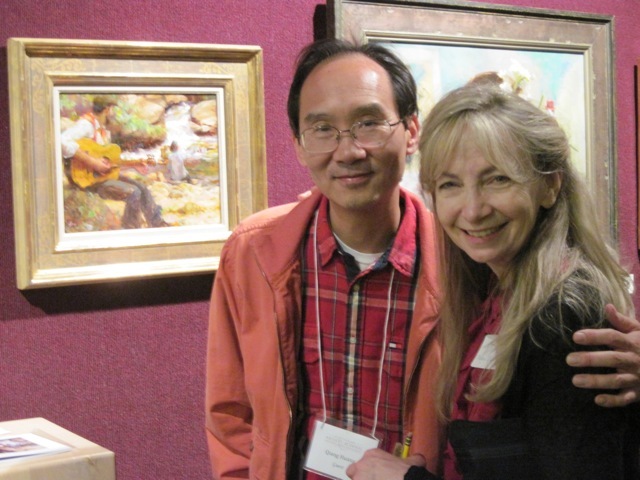 Li Hua is a fantastic contemporary artist, Please check her website to see her great work. Scottsdale is such a wonderful art center. I will come back in the near future. This is a very quick plain air sketch I did when I was on the cruise ship to the Caribbean Sea. I have been watching the recent Italian cruise ship sinking. It is shocking to see the a luxurious vocation turned into a nightmare just like that. So value the time you have. Live well and be careful. I am on the road again. I will be in Scottsdale attending the Putney painters show at the Legacy Gallery. I am so honored to be part of this wonderful group of painters learning art from Richard Schmid. I use this painting to practice the variation of subtle gray colors. The vase and the mug are slightly different in color. I used ultramarine blue, cad orange and white as my core gray and shifted that gray into yellow, blue, and purple by mixing with corresponding colors. I feel satisfied with this one. The value maybe a little dark, but in general I see progress. In my yesterday's post I mentioned the failure I had. I didn't mean the painting wasn't working, but it was my theory. I thought I could use terre verte and ultramarine violet to mix a purplish gray, but it was not a good choice. The color could not get dark value. Having wrong theories is very common in research. That is why experiments are so important. After several value study exercises, I carefully moving into the domain of color. My main goal is to understand gray. I opened my palette widely and involved quite a few colors I didn't use very often: Transparent Oxide Yellow, Transparent Orange, Terre Verte, Phthalo Turquoise, Raw Umber, and Ultramarine Violet to name some. I theorized models for the color gray, and I used this small painting to test my theory. But I have failed. I need to modify my theory and try again. Now my art has turned into a full blown scientific research. Do I need to write a thesis? Maybe I will. This week I didn't paint much, but I did some research on my art. There is so much I don't know in painting, Instead of simply just paint constantly, I need to examine my process to figure out the missing parts. I spent these several days researching on grays. Previously, I figure out several pair of colors I can make grays. This time I made some color charts by tinting different mixtures so I would know their individual characteristics. Next step, I will put those gray charts side by side so I will know their relationships. I feel this rigorous approach is necessary to achieve a true understanding. It will take me some time to finish this research and I will share with you what I have learned. Since I don't have a recent painting to show, I want to show this head study. I did this one on the cruise ship a half month ago. My portrait painting needs a lot of work too, but let me take care of value and color research first. We must set priorities. Coming back from Houston, I resume my small painting immediately. I know that is the only way I can improve myself in painting. Time will slip out so quick and you MUST grab it with a significant effort. With this painting, I continued on value study. I want make sure I can put high lights on the white vase, and use low values dominantly to paint the white cloth. I think it worked. Recently, I have noticed some major glitch on my website. My website hosting company said I owe them several hundreds dollars, which I don't think it is right. The Internet is very tricky world. There are wonderful tools, but they are not dependable. So if you see any problems related with my website, please don't be surprised. I am dealing with it now, and I apologize in advance if it causes you any inconvenience. I came back from Houston last night. This is my second demo at the workshop. This year, I have scheduled far more workshops than I did last year (for a very obvious reason). I need to adapt this new dynamically "nomadic" life style. I don't think I have the luxury of staying in my studio and working on my paintings systematically any more. I have to learn how to regulate a very irregular life and still progress. I wish I could slow down and live a life like the good old days, but I don't see that is possible. I will learn how to stitch all my fragmented time together to make it mean something. It is so ironic that a still life painter is having a very un-stilled life. Hee-Haw!!! After three days of rest, I am traveling again. I am at Houston now teaching a workshop at Houston Civic Art Association. I want to thank Jerrie Powell and HCAA for organizing this workshop together, and thank all the artist friends for attending. This is the demo I did today. I hope you like it. Continuing on value design and fold study. I hardly use any white for painting the table cloth. The illumination of the setup was very warm, so the brightest area on the cloth was pure "naples yellow light" (Winsor & Newton). My goal of this study is to see how dark I can go but still keeping the cloth appearing "white"looking. For these a couple of months, life to me likes a bowl of Gumbo. There are too many flavors combined. Good and bad things hodgepodged together like mixing too many colors on the palette. You know what it will turn into. I need a break from breaks and be still for a while to let my mind clearing up. I have detoured from my regular painting practice too long. I saw the quality of my art is going down, and it pushes me back almost to the drawing board, literally. Can't wait to be back to my studio. I did this painting last night. Down to the basics, the value design was my main focus. Improving on painting fabric folds is my second purpose. I feel pretty rusted now, but I will be better after some warming up. Happy New Year! We just arrived back to Austin. It feels so good to be home. I considered to post some photos on the cruise ship, but the cost was too much so I gave it up. This photo was shot at Costa Maya, Mexico. It was our first stop after two days voyage. Costa Maya is very small costal town. Because tourists come here by cruise ships only, it is rather quiet and not very commercially hit. The local people are very friendly, the beach is very clean. I have chances talking with the local people. There was not much traffic. Sitting on the beach with a coconut in hand, I think I am very lucky to see this virgin beauty of this planet. I hope this beauty remains for a long long time. I wish my visit would have not added stains on this pure land and water. I have done three paintings on the ship and I will share them with you later. We had several bad days on the cruise too. All three of us got sick. Some sort of stomach flue. I was so sick yesterday even I doubt I could drive back from New Orleans back to Austin. Well, I made it.